We’ve got a fresh idea this morning to add to the mix in attempt to extend our success with options calls as well. We are interested in tracking the WYNN Weekly $93-96.50 Calls for some quick-strike chances on a possible dip-and-rip setup. VSLR is one that we’re going to want to place on watch today, for reasons that are apparent when taking a quick look at the chart we’ve annotated below. We’ve got a number of bullish indicators as well as a strong bounce off of its lows over the past couple of days. We’ll be watching to see if the stock can maintain some of the momentum it’s built up over the preceding two sessions. Yesterday morning we were just mentioning the fact that we’d successfully tracked ASUV over an incredible five week run, seeing a trading range from .0024-.043, a swing of over 1600% The stock continued to push its upper limits, setting a new high as it traded from an early low of .03 to .051. 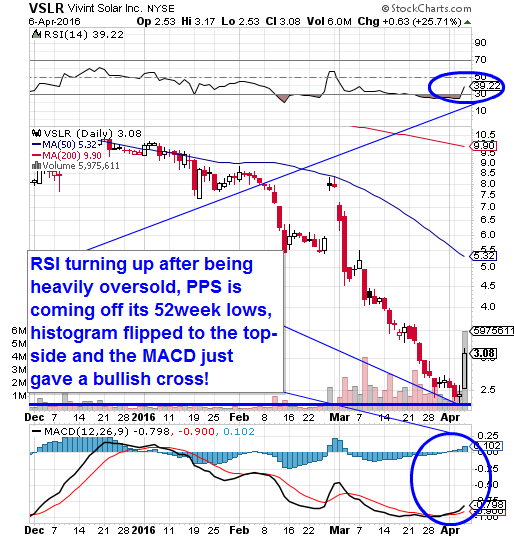 PSUN is a stock that we entered into the log as a possible bottom-bounce play yesterday morning and we observed exactly the type of action we expected. Nimble-fingered traders could have gotten in and out with profits of up to 52% inside of the first 45 minutes of the session as PSUN ran from .091-.138. We caught the company on the eve of filing bankruptcy(>>Read this morning’s PR), so it may be best to let the dust settle before considering a play on the stock again. Other more modest gainers from yesterday’s morning report included UWTI (+10%) and MOMO(+15%), so we’ll leave those on our radar in sessions to come. This entry was posted in Newsletters and tagged ASUV, CBDS, CEQP, CLDX, MOMO, OLLI, ORIG, PSUN, STZ, SUNE, UWTI, VRX, VSLR, ZNNC by Blue Horseshoe Stocks. Bookmark the permalink.